5 Steps to Reduce stress in your body. Dr Eliska Axford (Osteopath) is presenting on women’s health, stress and Osteopathy as part of our women’s health and wealth seminars. In her lecture she discusses the physical manifestations of stress within the body and she gets quite technical regarding hormones such as cortisol. We asked Eliska to provide us with some tips to help reduce stress within the body. 1. Relaxing: When you’re driving, and you stop at a set of lights, drop your elbows and relax your shoulders. 2. Time-Out: Take breaks from your workstation regularly, I suggest every 30-45 minutes to reduce the chance of falling back into “slouchy spine”. 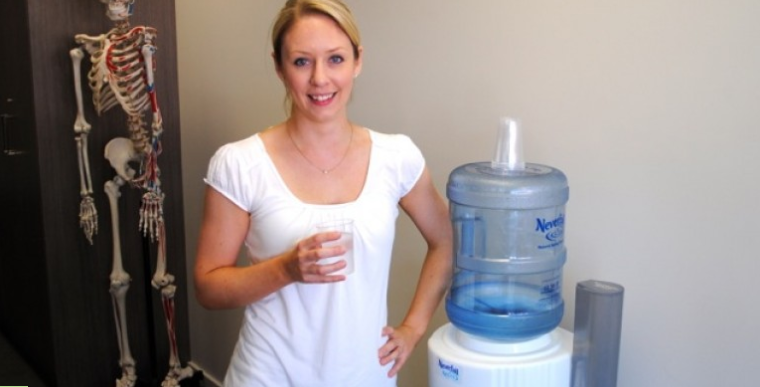 Take a walk to the water fountain, around the office or to the bathroom to get your blood pumping again. 3. Breathing: Take 3 deep belly breaths, counting to 5 on the way in and 5 on the way out. 4. Replenishing: ensure you drink 2L of water per day – but don’t fill up a big drink bottle, you’ll tend to drink more if you have a small 200ml cup on your desk and try to drink one glass every hour, it only takes a few gulps. 5. Stretching: particularly for those areas of the body that are compressed or under tension, two of my favourite ones are a lateral neck stretch and a pec stretch, both of which I find people benefit from doing intermittently throughout the day especially if they are using computers, electronic tablets or phones a lot. This is a general neck stretch that is often suitable when you’ve been at the desk on the computer. Aim: It targets the scalene and your upper trapezius muscles where many people experience tension. Caution: If you have a specific injury you should consult your Osteopath before attempting any stretches or exercises. Step 1 – Gently sitting on your hand, keeping your shoulders down and level. Step 2 – Laterally bend your head to the right. Step 3 – Take the left side of your head in your right hand. Gently draw your head and neck to the right. Hold 20-30 seconds and gently return to the centre. Repeat for other side. Stretch 2 – Chest Stretch. This is a general chest stretch that will stretch the pectoral muscles and aims to encourage an upright posture (helps to avoid the slouchy posture). If you are a regular mouse user, you may choose to spend a little more time doing this stretch on the side you use your mouse on. Caution: If you have a history of shoulder dislocation or instability this may not be suitable for you, please consult your Osteopath for clarification. Step 1 – Standing near the edge of a wall or in a door way bend your elbow to 90 degrees and place your palm and forearm against the edge of the wall as in the picture above. Step 2 – Place the same leg forward as the arm you are stretching. Gently moving forward you should start to feel a stretch in the chest area. – If you experience any pain in the shoulder joint with this stretch, stop immediately and consult your Osteopath. – Lightly contracting your abdomen can reduce the torsional or rotational forces into you mid and lower back. To perform a belly breath you may find it beneficial to place one hand on your chest and one hand on your belly. Using the hand on the chest area you can monitor and try not to move the chest whilst performing these breaths. The idea with a belly breathing is to use your diaphragm muscle under your rib cage and to avoid using the scalene muscles in your neck. The scalene muscles are often over worked and can contribute to neck tension. At times of emotional stress and meeting deadlines we often find ourselves at a desk performing any number of tasks. When you are seated at a desk especially after a big meal or when you are pregnant your diaphragm may be compressed and thus you often revert to using those scalene muscles in the neck again to assist with respiration. Just performing this simple task can often see people experience a reduction in neck tension and thus they will often cope better with a whole range of stress issues. Poor Desk Posture? – Dr Stuart’s favourite corrective exercise. Rotator Cuff Rehabilitation – External Rotation Exercises. 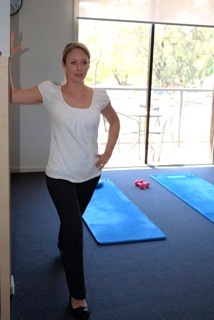 Gateway Osteopathy & Pilates Pty. Ltd.